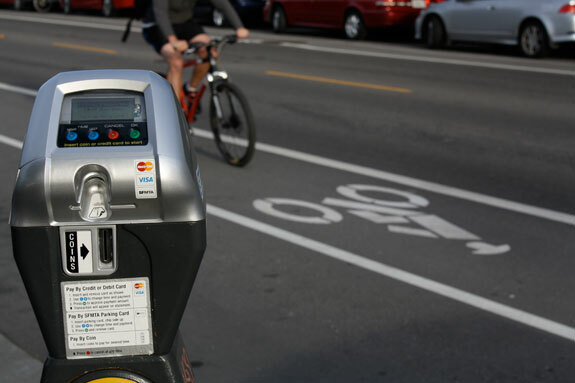 San Francisco launched the world’s most innovative parking pilot today, a federally-funded trial that promises to revolutionize the way cities manage and price metered curb parking. SFPark will make it easier for motorists to find spaces in busy commercial districts, while reducing congestion, speeding Muni, and improving air quality and safety for bicyclists and pedestrians. 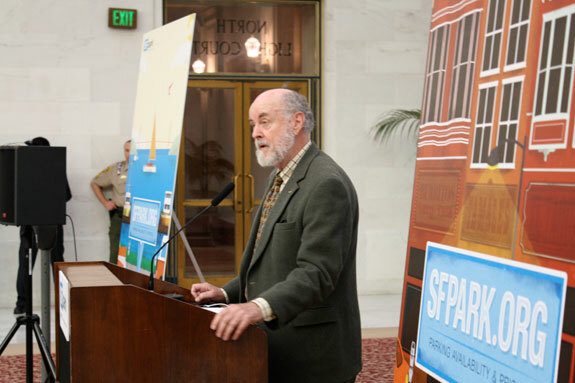 The milestone for SFPark was celebrated at a packed press conference in the North Light Court at City Hall this morning. 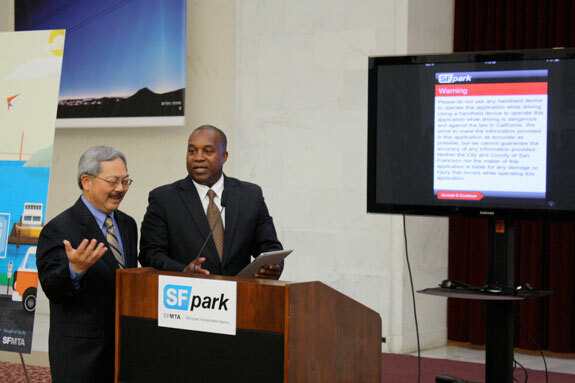 SFMTA Chief Nat Ford was joined by Mayor Ed Lee, parking guru and UCLA Professor Donald Shoup, and other dignitaries to announce the SFPark iPhone application and real-time parking availability data. The demand-based parking pilot is being implemented over the coming months, covering 7,000 of the city’s 28,800 metered spaces and 12,250 garage spaces. Drivers, thanks to street sensors, or magnetometers, will be able to check their iPhone application (an app will be available for Android in the coming weeks), or computer, to get real-time data on the availability and cost of parking spaces in 15 commercial districts. 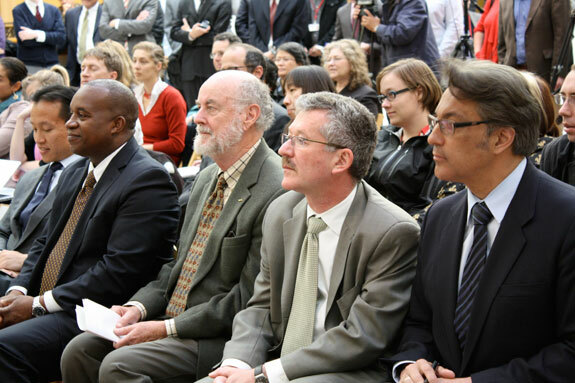 From left, Board of Supes Prez David Chiu, SFMTA Chief Nat Ford, UCLA Professor Donald Shoup, SFCTA Executive Director Jose Luis Moskovich, and Supervisor and TA Board Chair Ross Mirkarimi. Nadeau said the federal government was happy to award a $20 million grant to make SFPark happen, and that it was consistent with the livability goals of the U.S. Department of Transportation, led by Transportation Secretary Ray LaHood. Professor Shoup said the central idea behind SFPark is that you can’t set the right price for curb parking without first knowing how people are using that parking. Today’s City Hall event marked the culmination of years of work by the SFMTA on the project, which initially faced a wave of resistance, and now enjoys the full support of the city’s political establishment. SFMTA staffers, led by SFPark Manager Jay Primus and SFMTA CFO Sonali Bose, worked tirelessly over the past three years conducting outreach to elected officials, merchants and neighborhood groups. “Well, then you can always blame it on a dumb professor from Los Angeles,” Shoup said. "I think SFPark will give San Francisco the best of both worlds. If it works it will make San Francisco an even better place to live and work and visit and do business. It will be another feather in the city's cap and other cities around the world will copy you," said UCLA Professor and parking guru Donald Shoup. Everything is red in the evening. All the proof you need for evening meter hours. I’m interested in follow-up stories including first-hand accounts of it’s effects on individual driving behavior. For example, what about the person who drives a $1200 car and doesn’t own a $500 smart phone? So now people will be using their phones while driving, in order to find a place to park? How exactly does this fit with the state and national efforts to combat distracted driving? The most important question is merchant reaction. In theory, this should help retail business by making short-term meter parking more readily available. I hope to hear merchants saying that their business has improved. Agreed, but there is also personal responsibility. Look before you leave on your trip or have a passenger check the app if you are driving. However, the goal is to provide an open spot on each block so in theory there shouldn’t be a need for the app because parking will be available. Time to buy stock in illicit handicapped placard manufacturers in SF. Why? Because as the price goes up, so does the incentive to cheat. As long as handicapped placard=free parking, SF will be seeing the proportion of placards on their streets increase every quarter, which will push up the hourly rate but push down system-wide revenues. It’s time for the legislature to let cities opt out of free on-street parking for handicapped placards. Well they are providing an open data stream so any 3rd party device/app can use it. But even if you don’t have a fancy car or phone the dynamic pricing component should help everyone as it is targeted towards opening up slots on every block. Of course, if that they increase prices a lot everywhere, that’s going to impact the poor more, so it’ll be interesting to see where price levels end up in different neighborhoods. Explain how you would run back repeatedly to feed the meter, if you’re handicapped. This argument and the ad nauseam “waaah how are we supposed to use the app while driving? ?” questions are getting pretty tiresome, frankly. If you’d been reading about this program, you’d know that the city is only slowly rolling out unlimited parking at these meters. And pay-by-phone is not available yet. Nor is the sky falling, yet. If the car companies are smart, they will incorporate this into their real-time traffic GPS devices. In other words, the GPS can be set to find the cheapest spot within a certain distance of the destination in the same way some GPS devices send you along the least congested route. Could be very cool, and quite straight-forward to program. Yup. To the guest below. They shouldn’t have to run back to their meter, as their shouldn’t be time limits. The right price nullifies the need for time limits. You can’t manage parking by pricing if 12% of California motorists have zero exposure to that price signal. Free and unlimited parking for anyone is not appropriate for SF. To Mike (am I the only one who hates this new message structure? ), not everyone has a passenger, and many journey times are sufficiently long that “checking before you leave” won’t be timely. So we end up double-parking or blocking a bike lane while we use the SFPark App. So I hope you are correct that we simply “arrive” and – hey presto – there’s the theoretical parking spot. Exactly what I’ve been questioning, but the anti-car/driver people refuse to address it and decide to insult and throw personal attacks against me instead when I bring it up. This could easily be addressed with a few small urban street-sized changeable message signs that would easily tell drivers the general location where open parking spots. Instead, they spread bullsh*t about how they huge they are (they’re not-they are about the same size or only slightly bigger than the larger static signs), how they kill people (complete bulls***), how it turns the street into a freeway (more bulls***t), how the mere presence of the support structure already killed someone (the most outrageous bulls*** I have ever heard), and we shouldn’t inform drivers of any parking/road conditions ahead to discourage driving (why don’t we just remove all the signs on the street then?). Then they blame the driver when they look down at their smartphone and hit someone. “Look before you leave”. That defeats the purpose because by the time you get there, the parking situation changes again. Now, they will have to circle around, double park, etc. They could take their eyes off the road and look down at their smartphone to find the space, but then. BOOM. Another pedestrian killed. Blame the driver again. This could easily be solved with a few small urban street-sized changeable message signs on the major approaches to the SFPark areas. “But it’s going to mesmerized drivers into driving faster and kill people!! !” UGH! Just goes to prove that these anti-car/driver people want drivers to kill pedestrians. Same can be said for “Lionel,” but we veteran readers knows he gets everything wrong, anyway. Since no one read the second paragraph of Mike’s answer, I’ll reiterate: The goal is to keep a certain percentage of spots open. This is why pricing will change in the future. The goal is NOT for you to use the app to find a specific empty space. That would be insanely dangerous. Parking garages would be wise to take a cue from all this and, perhaps, install their own real-time pricing and availability meters.